Brendan Rodgers: Didn’t he earn two more seasons? A year ago, all of us, including myself, were raving about how good Brendan has been for Liverpool Football Club. A year ago, Liverpool were chasing Manchester City for the Premier League Crown, only to drop points in must win games – to Chelsea at home and then to Crystal Palace. Interesting thing is that both these games, if you ask me, were a testimonial of the lack of shrewdness and game management of Brendan’s team. Knowing Chelsea so well, they chased the game a little too much for my liking and allowed Chelsea counter attack. And at Crystal Palace, they threw away a 3 goal lead; guess they were focusing on scoring more to reduce the goal difference. But, this season was always supposed to be a test of Brendan’s complete management, much more than just of Shrewdness and Game Management. If I may say and if that’s how Liverpool owners wants to see Brendan’s time at Liverpool, he did learn from his mistakes and in the second half of this season, Liverpool showed pretty good resolve in terms of game management. From 14th Dec 2014 (when they lost to Manchester United) until 22nd March (when they lost to United again), in 13 games, Liverpool won a lot of games and they enjoyed clean sheets 8 times, many of them were wins by 1 goal margin. But the season was supposed to test Brendan in totality and not just game management. After the departure of Suarez, all eyes were on the club, as to how it will use the money received, to fill the gaps. A gap that was never filled! The biggest problem, that persisted thru out the season. And that one factor is the single biggest reason why Brendan could be in trouble or at least that’s debatable now. You cannot doubt his ability to manage the big names in the club (though I am still shocked and disgusted at how they dealt with Gerrard, but that has become a debate of its own). He brought the best out of both Suarez and Sturridge last season and these two literally took the club to the top. Tactically, most of the times, except and sadly at crucial times this season (when it has been a disaster), he has been lauded. But until now, no one in the club is sure of one formation or combination. The team suffered from this. The best thing he brought to the club is the kind of football which the fans admired, especially the last season. It was fast and exciting; sometimes the game was over in first 20 minutes. Best thing was, we still looked for more goals! For me, it comes down to how he or the club management or more precisely the famous “transfer committee” performed this season. Millions were spent on either above average players or punts. Ricky Lambert looked at Ok at times and tired other times. Most frustrating for me, he was barely used! You bought someone, who might well be playing his last years in the game and you don’t let him play! Fabio Borini never looked like a proper Premier League Striker. And Mario Balotelli? 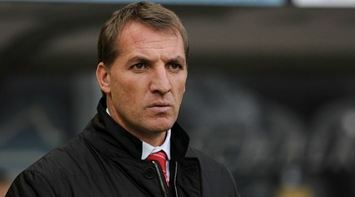 Did Brendan really think he can manage what Jose Mourinho and Mancini couldn’t? Well, if he thought so, he now knows. And at a very heavy cost. Mario was the biggest mistake of his managerial career according to me. Should he be replaced, if he can be replaced by someone who has the capability to take Liverpool upwards, or should he be given a season, with a better, stronger transfer market performance? Did you see those goals from Sergio Aguero yesterday? That’s what Suarez used to do for Liverpool last season. We need strikers like him to suit Brendan’s style of play. I believe, if he makes better recruitment decisions this summer, if Liverpool owners give him the money to buy real, quality strikers, we can reach Top 4 next season. #GetGerrardtoWembley was the cry & it indeed came through. FA Cup it is. Lets clear the semis hurdle & get to the finals! LFC attire in some form is mandatory. Registration is MANDATORY. Entry would be allowed only to those whose name is on the guest list. LFC attire is compulsory too! Names not on the list will be allowed only at the availability of seats at 100% Rock at 500 Cover charge. The guest list with the venue will be considered final. Any queries pertaining to registration/technical glitches on the form, feel free to call on the number(s) given below. Entries start at 6:30 PM! DelhiKop Match Screening: Arsenal v Liverpool! Registration is MANDATORY. Entry would be allowed only to those whose name is on the guest list. LFC attire is compulsory too! Official members need to carry their membership cards to be exempted from Cover/Entry charges and also mention the membership # details on the form. Names not on the list will be allowed only at the availability of seats at Movida at 500 Cover charge. There is an all Inclusive fix price menu (alcohol) for DelhiKop at Movida. Apart from alcohol, there will be a 20% food discount. Prices will not be clubbed with any other offer. The guest list with the venue will be considered final. Any queries pertaining to registration/technical glitches on the form, feel free to call on the number(s) given below. Entries start at 4:30PM! DelhiKop Match Screening: Liverpool v Manchester City! Back to winning ways, climbing up the table and clean sheets. What better way to welcome defending champions at Anfield. Just on a thought, last time we did beat them where Anfield rocked and 450 Reds rocked Delhi! The guest list with the venue will be considered final. Any queries pertaining to registration/technical glitches on the form, feel free to call on the number(s) given below. Entries start at 5:00 PM! DelhiKop Match Screening: Liverpool v West Ham United! Out of League cup. Yeah but hey, climbing up the league table is as important as ever! The guest list with the venue will be considered final. Any queries pertaining to registration/technical glitches on the form, feel free to call on the number(s) given below. Entries start at 8:00PM! Not today. Stevie. This was not supposed to happen today. ‘This happens in sport’, ‘Transfers keep happening’, ‘A time comes when they have to think about themselves’ and whatnot. This doesn’t happen in Sports, transfers don’t keep happening, this is Steven Gerrard! 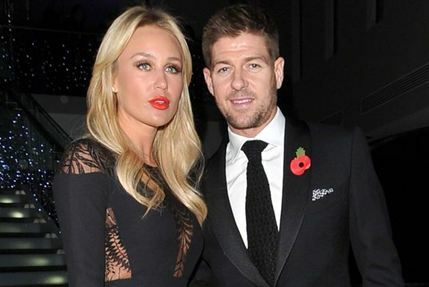 I thought this romance would never end, watching Stevie in another team would be like a nail to the eye. This is not Stevie and this is not Liverpool. This is Liverpool without Stevie and Stevie without Liverpool. No one would be complete without each other. People say at least he’ll play for another 5 months, I think it would be worse to see him play knowing that this might be his last match for Liverpool ever. This might be the last time, I’m watching him play. The thought hurts more than any physical pain in the world. When he goes, everyone will be in tears, even our Fortress Anfield will cry. you haven’t felt what I’ve felt. does not even begin to summarize what he has made me feel over the years. Torres got me thinking about Liverpool, Gerrard made me fall in love with the club, the fans, the whole ecosystem that surrounds Liverpool. I won’t go into stats, trophies, medals, the transfers he rejected and how many times he’s saved us single handedly. He didn’t have the pleasure of a premier league medal in his career but that only shows how he chose Liverpool over a premier league medal, he gave his all for the club and wanted Liverpool to win the trophy rather than him getting a medal. People tease me, reminding me of how he slipped a few months ago and lost the title, the title was lost at West Brom when we drew 1-1 and when Hull City beat us 3-1. If I was him, I’d have left Football for life after that slip, millions of fans watch Gerrard and look up to him and he slipped and everyone’s on his head. I couldn’t have handled the pressure. I might even had gone underground and maybe lost my mind. Gerrard has given me the gift I was not even aware of till now, the gift of belief, the gift of hope, the gift of faith. I have felt it multiple times, when we’ve been losing, when we’ve been going through a hard time, if Stevie’s in the team we still have a chance and eventually it came into my existence, my subconscious. In everything I do, I keep my faith, hope and belief alive no matter what I do. He was my Idol, My Inspiration. If I could I’d keep writing till the last match of the season.. There are so many moment, so many memories that he has given us. I know how I feel about this, every Liverpool fan must be crying or sad of this news, but it would be the hardest time for him, it would’ve been the hardest decision he’s ever had to make. I have loved you more than Liverpool FC itself and I will love you forever, my captain, my hero, my idol, my friend. You Will Never EVER Walk Alone! My Liverpool story is a sad one to some extent. When I started following the club, Liverpool had already lifted the Champions League trophy at Istanbul. Or should I say, Steven Gerrard had already inspired Liverpool to one of the greatest comeback the tournament will ever see. And to probably the greatest moment yet for any Liverpool fan. But I knew the story of Istanbul (had watched the adrenaline filled video 100 times) and had always looked up to him as a great captain, player, a family man. He was always my hero. I always looked at his family and admired him for the man he is and he has a dream family. For me it was always an “almost” perfect story. His passion and adrenaline during the big games always rushed thru my blood and I was always hoped that I will see a game that I will never forget in my life. I will never forget the free-kick he scored against United during the 2010 game which we lost 2-3. Stevie puts us back in the game twice: the perfect game was almost there, only to lose it in the end. But that was another hint of a Vintage Steven Gerrard. Since then though I saw him doing his usual “peach pass” in many games, but best of the memories were in 2013-2014 season when he made so many goals for Suarez and Sturridge. And that game against Manchester City when we grabbed the winner with Coutinho goal. Stevie was all pumped up to tell his team, we won’t let it go this time. I was pumped up too and almost could not sleep many nights in anxiety. That was the one of the best games of my life as a Liverpool fan.I was waiting for my incomplete footballing story to get its perfect end. It ended in a manner none of us ever anticipated and left me with a grave feeling: something I would never be able to heal myself with. Now imagine what he would be going thru each day of his remaining life. Having said that, no serious fan would ever blame him for us not winning the league. I would say it was yet another example of Steven Gerrard not getting his hand on that elusive trophy thanks to some mediocre team performance during the big games. I felt sad for him. I felt sad for myself. But as Stevie himself says: he we go again. And how he almost re-created the Olympiakos during the Basel game is unbelievable. Well they say, sometimes it doesn’t happen twice. Golden moments are not repeated. I missed it in 2005, but my admiration for this man never will be reduced. And who says every story has to end perfectly. Some people leave a mark on your life irrespective. It’s never about the trophies in the cabinet, but about the Man on the Field. If trophies were the criteria, he could have moved to Chelsea or Madrid long back. He chose to remain as a Loyal and Liverpool city’s most favourite son. The news that Steven Gerrard will leave Liverpool football club at the end of 2014-2015 season might have come as a surprising but yet an inevitable one for many in the football fraternity, but it is still something that millions of Liverpool Faithfull are still recovering from. This is not because Steven Gerrard is at the peak of his career or was part of Liverpool’s regular line up week in week out, nor because we were not contemplating something similar after he was left on bench for so many matches including on his 16 year anniversary appearance for Liverpool. But it’s because since his debut for Liverpool 16 years ago, he has been a star born for Liverpool football club. It’s only fair to say that all Liverpool success during these 16 years came with Gerrard’s crucial contributions: he scored when Liverpool beat Alaves in 2001 UEFA cup final, in the league cup final against Manchester United in 2003, in the FA Cup final and who can forget his thriller against Olympiakos in December 2004, which took Liverpool out of group stages of Champions League final and then the first goal against AC Milan in the unforgettable comeback win in the final. It was heartening to see him almost re doing the act for Liverpool during this year’s Champions League last group stage game against FC Basel with his trademark free-kick. It was “almost” another Gerrard Speared Breakthrough for Liverpool. He will probably leave Liverpool with one regret: not winning the Premier League with the club. But, what he did with generally a mediocre Liverpool side (especially if you compare it with Dalglish times), for me, puts him as one of the greatest player ever played and lead Liverpool FC. Liverpool FC supporters and admirers always looked up to Steven Gerrard as a midfielder who comes only second to Frank Lampard with respect to number of goals from a midfielder in Premier League, as a leader who lead the club to all the success they had in last 16 years, as one of the rare loyal footballer who served his club with same passion for more than a decade in spite of all the opportunities from different club. His shoes will not be filled ever at Liverpool FC. He gave me some of the best moments to live with. 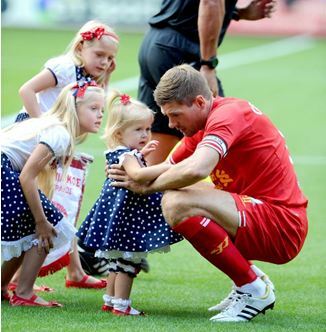 Thank you Steven Gerrard for the man you are. DelhiKop Match Screening: Sunderland v Liverpool! Alright then, we’ve the first screening of 2015. Also, every screening from now will be a testimonial to Stevie G.
The guest list with the venue will be considered final. Any queries pertaining to registration/technical glitches on the form, feel free to call on the number(s) given below. Entries start at 5:30 PM! 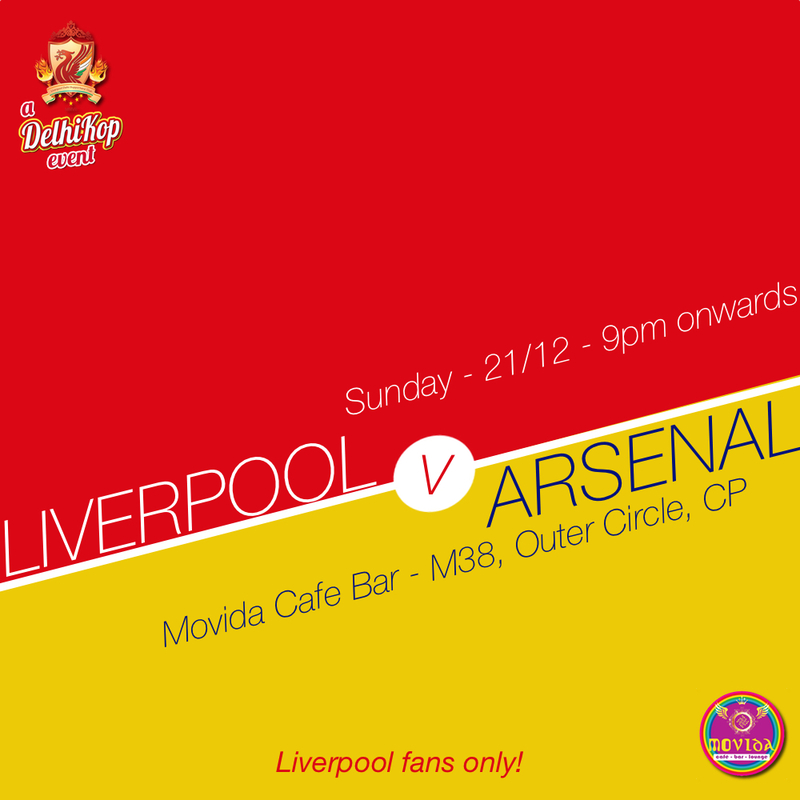 DelhiKop Match Screening: Liverpool v Arsenal! With Raheem and Markovic both rediscovering their scoring shoes, what better game to turn this season around! The guest list with the venue will be considered final. Any queries pertaining to registration/technical glitches on the form, feel free to call on the number(s) given below. Entries start at 9:00PM! DelhiKop Match Screening: Manchester United v Liverpool! What better game to turn this season around! DelhiKop Match Screening: Crystal Palace v Liverpool! Daniel Sturridge looks set to return, surely you all are itching to get your jerseys on and waiting for a Liverpool match! 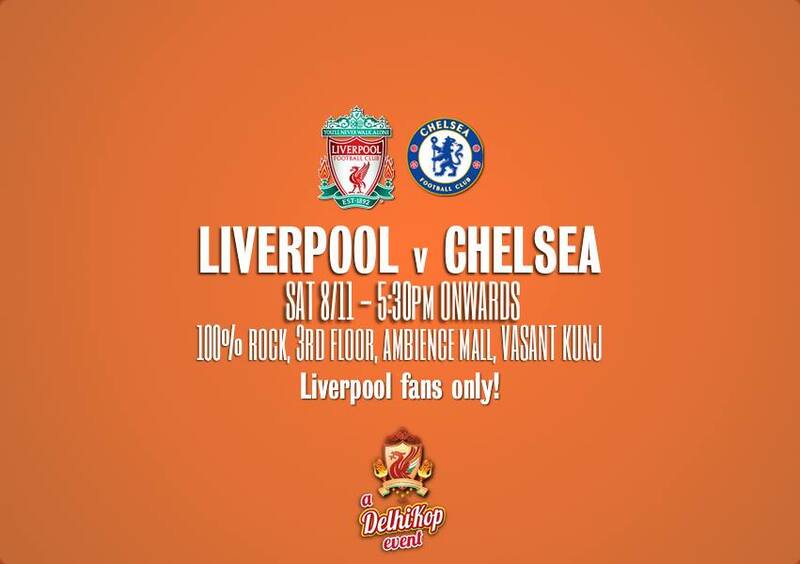 DelhiKop Match Screening: Liverpool v Chelsea! After a much spirited performance in Madrid, surely signs are positive and we can hope for a good weekend! So, Let’s get right behind our team and get the 3 points at Anfield on Saturday and put the campaign back on track! We’d prefer people wearing Liverpool FC colors to get quick access however, if there is no LFC merchandise, wear something RED. The venue is relatively new with DelhiKop and there are a few changes pertaining to entry options. Please have a look at it! 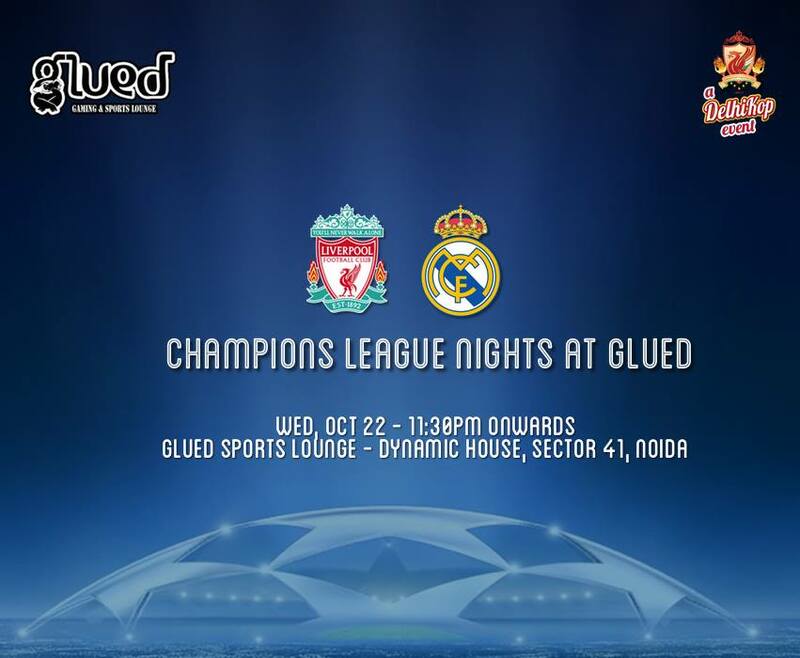 DelhiKop Match Screening: Liverpool v Real Madrid! They say “to be the best, you’ve to beat the best”! Two giants of European football meet each other at Anfield for what promises to be a treat for football fans. We as DelhiKop invite you to our screening on 22nd October at Glued, Noida 11:30 PM onwards. Please find more information below! I was hooked to TV for 6 hours from Saturday itself, with Premier League coming back after the international break and what a comeback it was. Good games, great goals, a good start before we get ready for our game at QPR. While I watched City and Arsenal games one after the other, I told myself that one thing that has been missing in our recent games, after the unfortunate injury to Sturridge and of course the departure of Suarez (oh god, when will I stop this!! ), is the X factor you need to convert chances in to goals. Sergio Aguero’s first goal for Man City against Spurs and Sanchez’s first goal against Hull clearly shows what one moment of magic or if you want to call it, that extra ordinary finishing skills from your striker, can change the whole complexion of the game and hence, the result too. Goes without saying how it lifts up the fans and the whole team. I was convinced that we have been missing exactly that X factor in our recent games. Clearly, Mario Balotelli has not been that factor for us and today’s game against QPR was another example. He was poor according to me. There was nothing Super about him at all. Chances after chances and he wasted them. much like he did against Everton. And as the games are passing by without he scoring his first premier league goal for Liverpool, he is feeling the pressure , the frustration and his body language and moment in the pitch has become pathetic. I must say, I will be the happiest man in the world if he comes good for us, but with more games passing by, more convinced I get that we need to look for alternatives now. After today’s game, I really thought that Borini might have given more positives to the game. Could be wrong, it’s a personal opinion. That said, it was an amazing game, not because we really played well to deserve the 3 points, but the way it eventually pan out in the second half and the way, we at least never gave up and eventually got lucky! In fact, we were lucky right from the first minute with QPR right on top of us in every department of the game and with close escapes at the 28th and 34th minutes with Leroy Fer striking the bar twice. But, I guess, it was a day, (remembering all those unlucky moments during 2012 season), we got lucky for a change. It was our day and it was just not Harry Rednapp’s. I thought we were too predictable as well in the first half with Sterling either making the run and trying to play Balotelli or long passes thru our Middle 4, trying to counter, looking to find a player near the final third. This did not work at all and QPR enjoyed good possession and obviously more clear cut chances to score. Against the run of the play though, we did come close to score thanks to Steven Gerrard’s attempt, but in summary for me, it was a pathetic half for us. I won’t put the whole blame on Balotelli for this one. His worst came on the second half actually. Every one during the break said Gerrard needs to go back and he did go back and it made some impact and he was in much better control of the ball. It did not made a huge different though, as QPR, I thought was still much better in the game, much more eager for the ball. I can’t remember how many times Jose Enrique was crowded and he threw the ball out? We did not have the finishing factor we needed, was also showcased during the 47th minute, when Sterling made an excellent run, giving it to Lallana and Lallana playing Henderson in the final third, only to see him hitting it wide and over. It was repeated in the 61st minute and it was Balotelli this time in the final third, with space, but he could not convert. It was all dull and poor for Liverpool and something special was needed to change that. And it came again thanks to our 19 year old super star. The game took an unexpected turn during the 67th minute, thanks to another great run from Sterling, winning the free kick, making use of lack of awareness and concentration from QPR players at the defence and taking a quick one and playing Glen Johnson, who swung the ball in. It was to bring Balotelli in the game, only to hit an unfortunate QPR defender Dunne for an own goal. We might not have deserved it, but I will give it to Sterling’s and Johnson’s energy there. Then happened, what has always happened – sadly, frustrating, without a miss. We could not close off the game, yet again and conceded a loose one, yet again from a set piece. This time during the 87th Minute. I have always been a great fan of Coutinho and his lack of form has frustrated me more than anything else, but he made an impact right from the moment he came on during the 66th minute . And how he made this opportunity count with his excellent finish to the far corner on the 90th – again though thanks to a run from Sterling and a pass this time by Stevie. I thought we won a great game! But we had to concede again on the 92nd, only to have a different sort of ending this time, getting a winner on the 94th Minute of the game. This time it was Coutinho who picked Sterling. The moment Sterling took the ball to the final third, I was shouting “Sterling will do what Sterling does best today: put it back of the net”. He doesn’t though: he tries to play in Balotelli, only to find another QPR body ( Steven Caulker this time) and getting the ball in the net for us. I was down laughing on the floor: what a game, what a day. But if you see the slow motion of the last goal again from another angle, you will see a disappointed and Frustrated Balotelli as he sees the ball going inside the goal. Well, he must surely be relieved that the team won, but he knew that another possible opportunity for him to score his first League Goal for Liverpool went begging. I am extremely happy the way it ended, I want to celebrate tonight. I am very happy to get 3 points and move up the table. Very happy to see the fight back. Extremely happy to see Coutinho Scoring Assisting. But I doubt now that Balotelli will prove to be a Super One. Not because of the fact that he hasn’t yet scored, but because of his contribution to the game overall. He barely moves at times, he is caught offside so many times, simply because he is slow to get back and he has become a frustrating figure, who has missed some easy chances in last few games. What would you do if you are BR? Should you show your trust on him and give him more time? Should you give Borini or Ricky a full game? I mean come on, hasn’t been its frustrating to see Ricky on the bench – all the time?!! Whatever we do, we do need to pray harder to have Sturridge back in the team and probably get ready to buy another striker during January. Don’t take me wrong: I will be happy to see Mario Scoring. But I don’t see it happening: what’s your say? 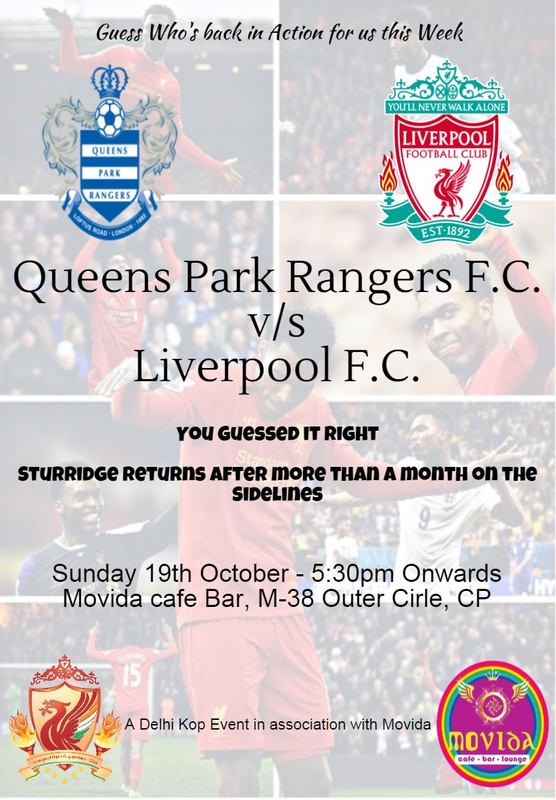 DelhiKop Match Screening – QPR v Liverpool! International break and lack of Liverpool football, surely you all are itching to get your jerseys on and waiting for a Liverpool match! Fancy being at Anfield? As Official Liverpool Supporters Club, DelhiKop gets some ticketing privileges from LFC. For the second half of 2014-15, we’ve been given a total of 9 matches to choose from! Please be careful while selecting the matches and for your convenience, the kick off times (BST) have been mentioned. 1. As an OLSC, we’re entitled to some ticketing privileges by LFC. For the 2nd half of the current campaign, we’ve been given the following matches to choose from! 2. If you’re willing to go in groups, please fill this form separately for every person going. 3. At one time, you can select 1 match from the drop down. 4. Filling this form doesn’t guarantee a ticket, final decision on that will be taken by Liverpool FC. We’ll inform you about the same as and when it happens. 5. Please select the match carefully and for your reference the current Kick Off (BST) times are mentioned. However, this might -change over the course of the season. Fill the form below and we’ll update you. I am working on a dream…..
It’s a beautiful song by Bruce Springsteen, have you heard it? No, trust me; this is still a footballing article, not about romance or life otherwise. But wait, I would say, yes, it is about romance and life. I mean you can take it whichever way you would want to take it. To avoid this annoying confusion, this is what happened: I happened to hear this song when Liverpool just finished its game against West Ham last Saturday evening. And there won’t be a bigger coincidence. This was also an evening when I received a set back from my work place too. Evening never ended the way it should have for all of us and for me personally too. I was sitting in my sofa for hours, thinking when this will change? Coincidently, I had the same thought both for the game, as well as for my work. Frankly, I will not bother you with my personal life, that’s not the objective of this write up. But for a moment, I realized how close my dreams are to each other. A dream of achieving that goal in my career. A dream of a proud and exciting life. A dream of my love completing my life. A dream of Liverpool winning the League. Sounds like “what the F”? Yeah, kind of. But this is it! We have had a great last season, an amazing one in fact. The derby was not even played like a derby, rivals were blasted away from the game. Our age old rivals were made to lick their wounds (you know what I am talking about). 2013-2014, for me was the year of getting higher on my career goal as well as feeling the love i never felt before. We kind of expected this season to start the way it has to “some extent”, with so many new faces in the team, as well so many early season injuries. Plus other teams coming to grip of our attacking style. But, we did not expect it to be this bad. We did not expect to lose 3 of the first 5 games. Suddenly it was like the 2010-2011 or 2011-2012 season, the way we were left frustrated to close off the games. Sometimes, the dejected mind tells you, we will never be good enough again to win the league, leave alone the champions league. Is it worth waiting for years and years, expecting something that may never ever happen. Ask a neutral, not a United fan, ask a real neutral, they don’t expect it to happen in years coming ahead. Some say, it was just Suarez and Sturridge magic last season, and, it’s over. Is it worth it? I say yes, of course it’s worth it. It’s worth waiting until you die in fact. I mean what kind of love it is, if it gives up. I was gutted last evening, seeing Liverpool conceding another dying moment goal. But when I see the highlights of the game, I only have feeling of positivity and a never dying obsession for the club. I said to my friend 2 years back “Liverpool is one of the reasons I am alive”. I was kind of drunk, but I don’t think I lied or exaggerated. Win or lose, we are Liverpool. We are not the fans, who change their loyalty for glory. We are a proud bunch of knuckleheads, who are in a stupid obsession with the best club in the world and we are working on a dream. We are working on a dream to lift the league title, imagine how beautiful it will be if it happens for once. We are fans who wear the badge of loyalty, because we have the backs of those who carry their cross week in week out for the club. We don’t have to win every week to be Kopites, do we? After a lacklustre display at home against Villa and then at West Ham, I think we were much much better at the Derby. We were aggressive, we created many chances. We had 24 shots, 8 on goal. Comparing to this we had 11 shots/ 5 on target against West Ham. We were horrible against Villa at Home. We could clearly see the improvement in Lallana, Coutinho and in our defence. One thing that was lacking in last couple of games was balls coming from right and left sides. In Comparison with West Ham game, where we had 10 each, there were 16 from left and 8 from right. And it’s not about the number, it’s about the quality. We found the strikers on many occasions, but the end product was missing. Media before the game was full of criticism of Steven Gerrard and how he did he reply! His long balls are still the best in the league, he managed to find the right heads with his corners, he won tackles and he of course scored that magnificent free kick. That goal could have been the beginning, a beginning of more goals. Had Lallana found the net in the 10th Minute and had Balotelli just tapped in the ball in the 66th, Jagielka’s injury time stunner would not have mattered. You cannot deny it was another good Derby, though we have seen better, but we could see more positives than negatives. We are hosting West Brom On Saturday. Lets keep dreaming – here we go again! 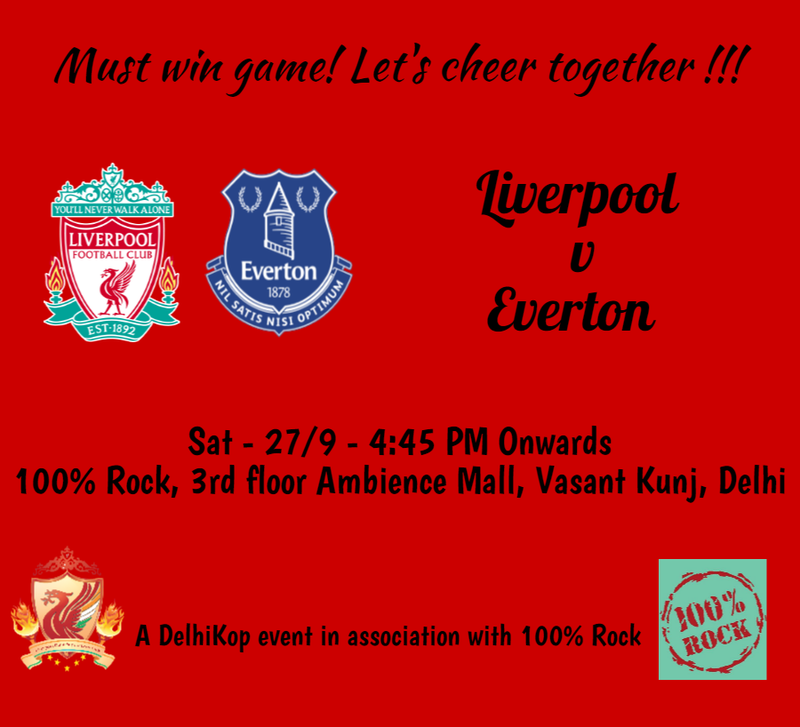 DelhiKop Match Screening – Liverpool V Everton! Perfect game to bounce back from back to back Premier League defeats. Lets get right behind our team and get the 3 points at Anfield on Saturday and put the campaign back on track! The venue is different and there are a few changes pertaining to entry options. Please have a look at it! The guest list with the venue will be considered final. Any queries pertaining to registration/technical glitches on the form, feel free to call on the number(s) given below. Entries start at 4:45 PM! The Amazingness is back for Liverpool! The Amazingness is back for Liverpool. Last time they played in Champions league was in December 2009, when the game ended with a stoppage time loss to Fiorentina at Anfield ending Liverpool’s campaign in Champions league that year. They were out in the group stage itself. To be very honest, I didn’t experience that. But it sounds like a start of a downfall. Frankly, my love for the club is not as old as yours. I fell for it during the 2010 season and never took my eyes off it. It became my passion, my footballing obsession. Obviously that was the year Liverpool could not play in Champions League. 4 seasons since then and I always wondered if my Footballing Love will ever make my European Nights Complete and even more beautiful. One thing that made me proud in all these years is that I never doubted it, just waited for it eagerly – a lifelong obsession, a lifelong faith. You talk about Liverpool and Istanbul glory and Champions League glory comes with it. Goosebumps you get when you read about those nights when your club was involved in those unforgettable games. Funny thing is, it was 2007 when my boss once asked while on a drive for a meeting “so where are you watching the Liverpool AC Milan game tonight”. I was like what? (yeah, that was me back then). Then he briefed me of what happened in Istanbul 2 years back and hence, what tonight’s game is all about. And he was right, I was in Qatar and believe me, all Qatari papers were filled with preview on this Final. I can swear, the whole town was talking about it. Well, I did not happen to see the final, I wasn’t much into football then, but I understand today what I have been missing since then. But how wonderfully since then, my faith paid off, thanks to an amazing season 2013-2014. We are kind of unexpectedly, handsomely back in Europe and although I cannot do anything about missing that night in 2005 and another one in 2007, but I can start dreaming again, have faith and until then have a pint with Liverpool on TV at the Champions League. It’s a Wonderful and Proud Feeling! Especially when our biggest competitor is on the other side, trying to make for next year’s Champions League Qualification! I am not sure how many of you will agree with me and how many will hit me for saying this that it would have been just perfect had Suarez been part of the Club on Tuesday night. His sheer energy and passion for the game is perfectly suited for the Nights. But no one is bigger than the club and we have certainly moved on with a new set up and new promise. New set up, new promise is an apt thing to say from Tuesday’ experience – Liverpool’s first Champions League game after nearly 5 years. They say you need European Experience to excel in the competition and we understand what it means. We went with a new team, a new set of players who have not played many games even in the league together. And with the unfortunate injuries to so many – Sturridge to say the least, it made the combination even more of a starter. That’s how I will sum up the game that happened. What a night it was, right from the beginning. That Champions League music at the Anfield, that grin on our faces after so many years. Most importantly, there was a sense of huge excitement but also some nerves and question on what the team will exactly do. For me personally, it was no doubt exciting but frustrating at times. You wonder how it will be if the team plays the way they played in the League last year and much of the first part of this year. But the harsh reality is that the team was facing a new challenge altogether and with at least 5 new faces in the team from that team of last season, it was never going to be a walk in the park. It was a frustrating first half for me with the Ball never picking the right player in the area, the missing link between Coutinho, Sterling and Balotelli, the frustrating bad form for Coutinho, and some selfish choices made by the front men. Apart from couple of Shots on goal by Balotelli and Lallana, it was more of a “what it could have and should have been”. The most sumptuous part of the play in the half was Moreno. He was simply outstanding and for now, seems like our best buy of the year. He ran all over the park and back to do his defensive duties, tried THAT Spurs goal. He was good to watch. Second half showed an improved and calmed team (goes without saying what BR must have said inside). There was more possession near the edge of the area. But that last ball inside was still missing, one due to so many bodies of Ludogorets players and two due to that still lack in link between our midfielders and strikers. It was Aston Villa all over again, I was thinking probably one individual brilliant moment is needed from someone. No show off, but it was perhaps that moment of brilliance and perseverance from Balotelli in the 82nd minute. I could not believe that it’s a goal until the celebrations started at the Kop. I must say though that our game improved to a great extent even before that. Needless to say, it took us 69th minute to throw that first perfect ball in that area, first time finding a man – Borini, making Borjan stretching to save it for Ludogorets. You sometimes feel it’s your night or not in football. That frustrating Aston Villa game had Coutinho hitting the bar and today it was Ludogorets on that side – you just knew it’s your night. And how our night it was indeed! We had to experience that Sick feeling after giving away the lead yet again – I wondered if I will be able to sleep tonight. Crystal Palace game haunted me for quite some time. But it was our night after all – you have to give credit to Manquillo for running in and forcing that foul from Borjan in the dying moments. You never doubt Stevie with a penalty, but it was huge moment for Liverpool. When you are back in the elite tournament after 5 years, you need to win the home game before anything else. And we just managed it. I would not stop myself saying that it was not the most comfortable nights of football, it was not a performance that every Liverpool supporter can talk about, but it was a perfect result on a perfect night – a night we came back where we belonged. I heard on TV most match “Liverpool lacked the creativity they are known for since the last season”. I could not agree more with that. But I guess its lack of experience in the Champions League added by an entirely new set up on the field than anything else that we clearly saw in the game. This team will take some time to gel , some experience and few wins under the belt and I am sure it will be a different experience altogether then. Basel next. And with the result at Bernabeu, we have a right to be positive. Bring Sturridge back there and hopefully Coutinho in form and we have an amazing night in store for us. 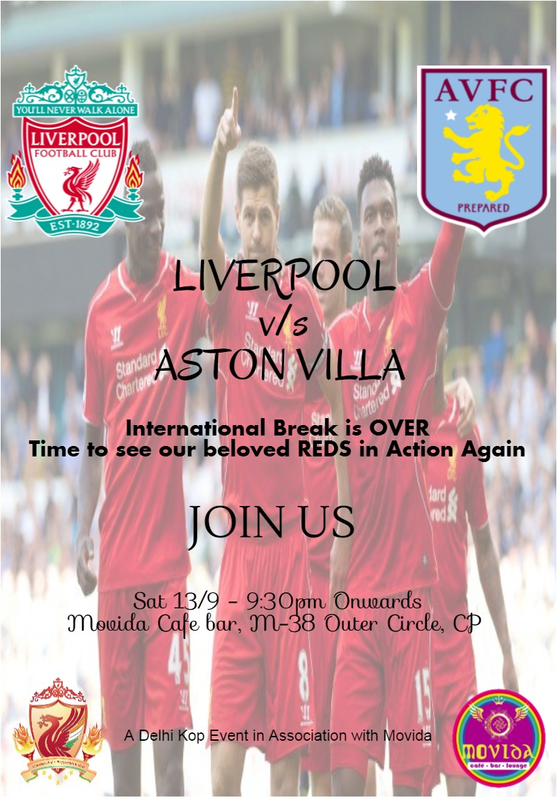 DelhiKop Match Screening – Liverpool v Aston Villa! The guest list with the venue will be considered final. Any queries pertaining to registration/technical glitches on the form, feel free to call on the number(s) given below. Entries start at 9:30 PM!